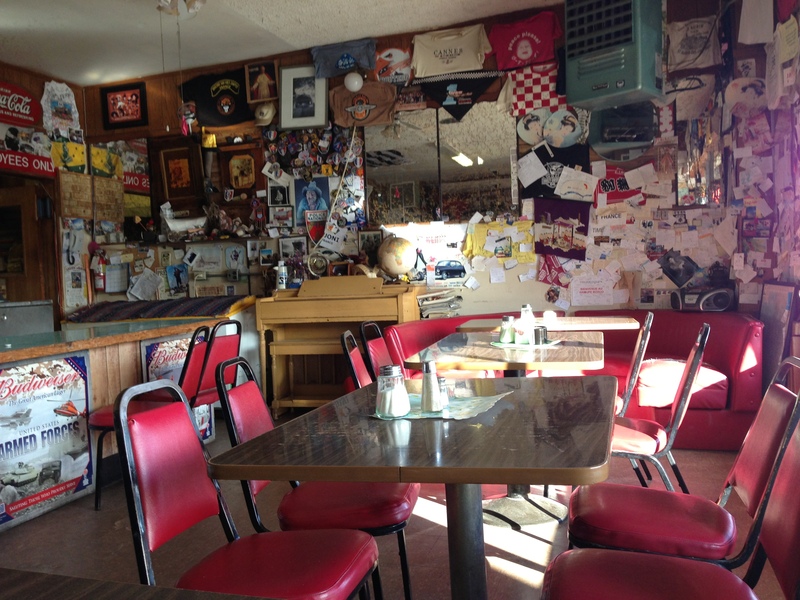 Bagdad Cafe, Newberry Springs, CA. It would be just another decrepit café sitting along a gone Route 66, sucking in dust, if it weren’t for the French tourists. God bless them. The smell of griddle grease is like an old regular slouching around and noticeable as soon as we push open the door. The place is quiet and dirty, covered with layers of movie and tourist mementos, faded by the desert sun in stapled piles on the walls and ceiling. It’s gone beyond the level of kitsch. One guy, standing behind the cash register takes our order from where he stands. Another guy, a toothless local hustles around us, shoving menus, a screenplay, some other memorabilia into our hands, all the while handing us our cheap domestic beers. It’s quiet in there, the dust motes drifting as they do in a place where the past hangs in the air. We think the quiet and our qualification as objects of interest (women, breathing) account for the attention. Did we know that a famous movie was filmed at that very location? How about that people from all over the world come to visit because of that famous movie? It won an award in France, where it’s famous now. My friend and I take in the crumbling movie posters and sip our beers, planning our exit. These people are clearly delusional. That’s when the tourist bus pulls up, spilling French tourists. 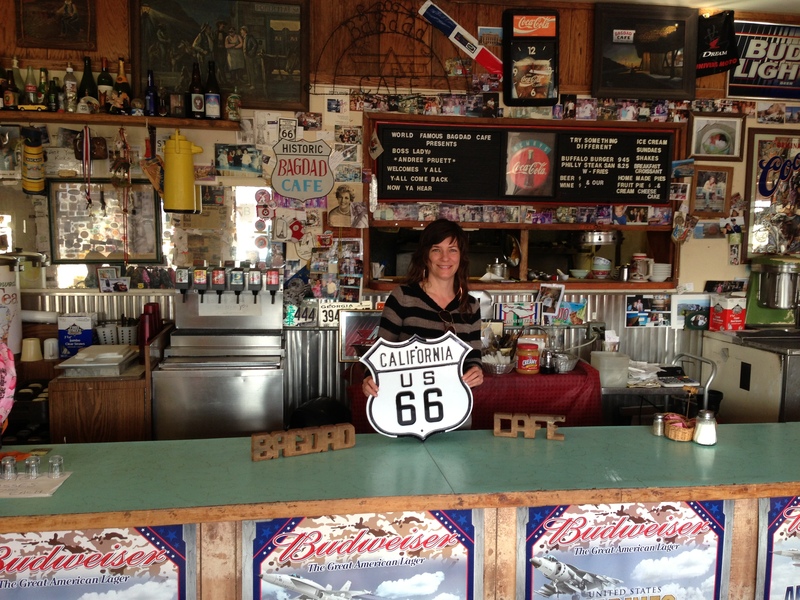 1) Are you currently on a tour bus in the Mojave Desert in California scheduled to stop at the café? 2) Are you a fan of the 1987 German comedy of the same name, filmed on location, set in a remote truck-stop café and motel and centering on two women who have recently separated from their husbands and the blossoming friendship that ensues? 3) Have you seen the California’s Gold episode where Huell Howser makes a seat of the pants visit to the Bagdad Café and catches everybody, except maybe General Bob, resident of the world, off guard? If not, do yourself a favor. 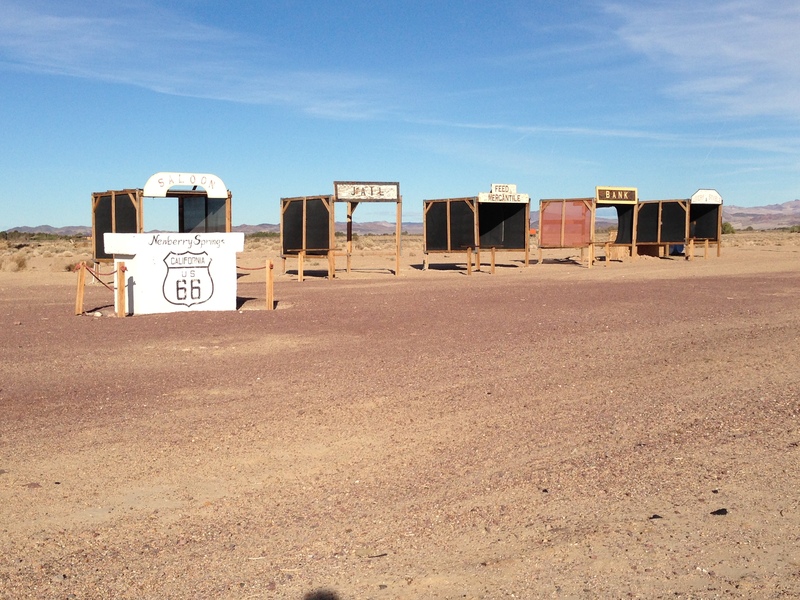 4) Will you stop at any roadside attraction, no matter how dubious including but not limited to, miniature western towns, the world’s largest anything, historical markers, buildings shaped like shoes, spaceships, donuts, etc.? The place is quiet again when the tourists leave. My friend and I are still reeling slightly from the spectacle. As with many places I visit, I came here out of nostalgia and curiosity. 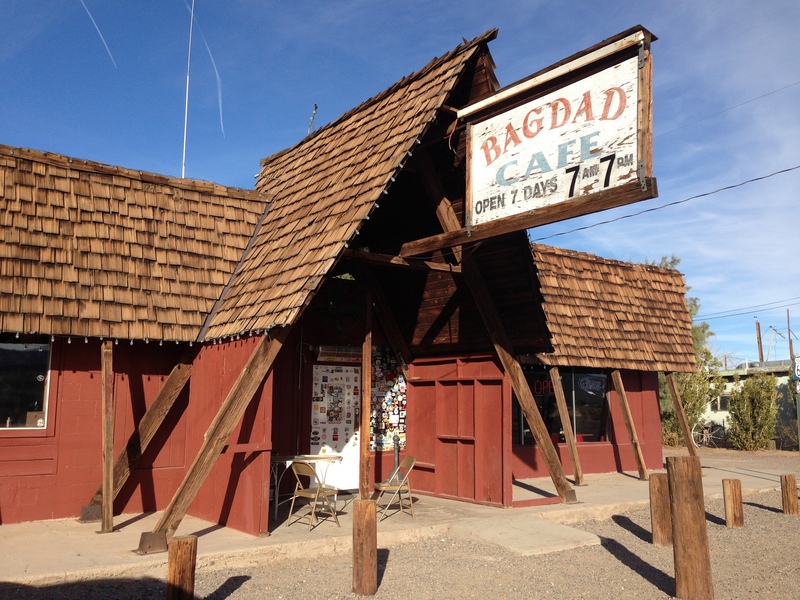 I didn’t find the past at the Bagdad Café. Instead I found a postmodern square dance, a place playing itself in a miniature drama re-enacted past the point of being worn out. It reminded me of that strange period in history, the Wild West shows, where the battles of the west were played out for entertainment by real cowboys, real American Indians, in the 1880s, just on the tailwind of the actual events. Very interesting photographs and posts on your blog, thoroughly enjoying them. I am a fanatic of the American Southwest and the secrets it holds as well. Thanks for following! There is a lot out there–hidden ghost towns, oases, rock art. I’ve been having a great time trying to explore some of it! Oh I know! We took a trip out there (AZ, Utah, NM, TX & Colorado) over the course of a few weeks and missed as much as we got to see – of course that requires a few more trips in the future. Saw some unbelievable rock art. Have you ever heard of the Rock Art Ranch? It’s located not too far from Winslow, AZ. Great place to look into; one of the widely unknown highlights of our trip. Thanks for the tip! I would love to check it out. I spend most of my time in the CA desert, but I want to get out more to the rest of the southwest and TX. We have a tour booked to the Coso Range petroglyphs in April–biggest concentration of rock art in the Western Hemisphere but on the China Lake Naval Weapons base–hence the tour. I’ll post some pics on here! That sounds like an incredible journey! Never been to the CA desert, but Arizona and Utah completely mesmerized me. Rock Art Ranch is a working ranch in the middle of nowhere, you call ahead and he’ll give you a tour of his collections, and there is a canyon on his land that we were allowed to tour – 50 foot down to the bottom where over 3,000 petroglyphs can be viewed and photographed, not to mention exploring the cliffs and vegetation themselves. Walnut Canyon is another place of interest in Arizona – approx. 300 ancient ruins in one canyon that you can hike through. Mesa Verde, Colorado has the largest “in-tact” ruins in the country – all things that it sounds like you would have a spectacular time experiencing. I look forward to seeing your pics!